Who doesn’t love chicken wings? These babies are spicy, crispy and perfect for your next weekend party! Chicken wings are always a crowd favorite. Whether you are serving them up for a party or for dinner, they are guaranteed to be a success. 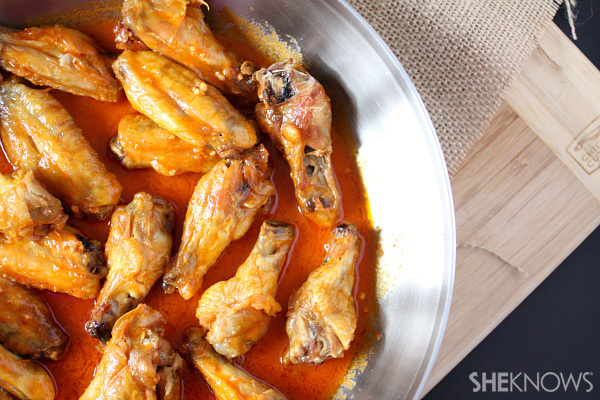 These little wings have been cooked in a spicy Sriracha Buffalo sauce and are sure to bring the heat. These wings are for the folks who crave heat! Add a large pot of water to the stove and heat until boiling. Add in half of the chicken drumettes and cook for 5 minutes until some of the fat has cooked off. You will see it floating to the top. Let water get back to a boil and add the remaining drumettes. Drain chicken drumettes and add to a rimmed baking sheet that has been lined with foil. Bake for about 30 minutes, flipping once while cooking, till the skin is crisp. While the wings are baking start making the sauce. Heat the oil over medium heat and add in garlic. Cook for a few minutes until the garlic is fragrant. Add in tomato sauce, Sriracha sauce, dark brown sugar, apple cider vinegar and kosher salt. Whisk together over low heat and cook for about 5 minutes just to give the flavors time to meld. Remove the wings from the oven and toss in the hot sauce. Serve immediately.